(EN) It is three a.m in Berlin and there are several hundred nearly naked bodies swaying, heads tilted back in tranced-out bliss, pulverized by the relentlessly throbbing kick drum pouring out of the bone-rattling Funktion One soundsystem at Berghain. (EN) It is almost entirely dark, dense with artificial fog and cigarette smoke. The beat is fast and overpowering, hypnotically luring everyone into a physical unison. This is the libertine capital of the world, where the sweat-slicked bodies around are felt before seen—and calmly flitting through a case of vinyl above the crowd is Marcel Dettmann, resident DJ of Berghain since 1999. He selects a new record and looks out to the crowd. This sense of freedom carried on throughout his life—exploring the emerging club scene in ’90s Berlin and going on to become one of the most renowned techno DJs and producers in the world. Marcel has become something of an international ambassador for Berlin techno, playing at nightclubs around the world: from Buenos Aires to Ibiza, Tel Aviv, Florence, Tokyo and back to play his monthly set at Berghain. He was tapped to created a mix for the legendary DJ Kicks, not to mention his productions, which have become staples in any techno DJ’s library. This portrait is part of our ongoing collaboration with ZEIT Online. Head over to ZEIT Magazin Online to see more images and further insights on Marcel. (EN) The first six Berghain flyers—the final flyer promoting Ostgut featured birds flying away, dissolving the logo of Ostgut, only to form the Berghain logo featured in the first flyer. (EN) Marcel has around 5000 records in his home, with plenty more in his studio and (like any DJ) a few crates at his parents’ house. (EN) Despite his notoriety as a DJ, seeing Marcel padding around in his socks dodging toy cars on the carpet, it’s difficult to imagine him being the conductor of the Dionysian mayhem that occurs at Berghain. He lives in an apartment in Prenzlauer Berg, a quiet neighborhood of Berlin, with his wife and two young kids—whose presence is immediately felt. In the living room, his son’s crib brims with tiny multi-colored animal shaped toys. On the wall is a print by friend and photographer Friederike von Rauch and underneath it are a series of drawings from Marcel’s daughter. “I told her this is one of my favorite pieces of art and she started hanging her own art here,” he says with a laugh. Marcel is used to states of flux as a touring DJ—over summer he only gets to spend a handful of days a month with his family and his schedule has him roving all over the world. “Often I only get two hours of sleep or no sleep at all. Sometimes I’ll leave a club at six or seven in the morning and have a flight at nine so I have to go straight to the airport and arrive in the next city seven hours later. It’s not necessarily something you want to share with your family!” he says. (EN) Over the years, Marcel has collected flyers and ephemera from the various parties he’s DJ’ed at. One such growth is the separation between work life and personal life forged into the layout of his home, a home that unusually features a sound isolated room-in-room where he can listen to new records. With the door closed, the room feels more like a boutique record shop than a home. He also has a dedicated studio outside of his home for working on his productions, “I needed a place where I could go for a few hours and just focus on music. I never wanted to be someone who has to ‘focus on their job.’ But sometimes you need focus—otherwise you lose everything. You lose your family and your music because you’re a little bit here and a little bit there. Before, I was doing everything at home. That’s something that changed when I had kids but I did it because I want to spend time with my family. When my family is home I can’t sit in my home studio and hear my kids playing while making music! I can’t do that,” he says earnestly. (EN) This photograph was taken by Berghain bouncer and photographer, Sven Marquardt. Thank you Marcel for giving us insight into how you balance your personal and professional life. Marcel Dettmann is an international DJ and producer whose name is synonymous with techno. He has been a resident DJ at the nightclub Berghain since 1999. In addition to DJ’ing, Marcel has previously collaborated on exhibitions with photographers Friederike von Rauch and Sven Marquardt. He has released records on Ostgut Ton, 50Weapons, Beatstreet and his own Label, Marcel Dettmann Records. You can find him in the best nightclubs around the world or during his monthly set at Berghain. 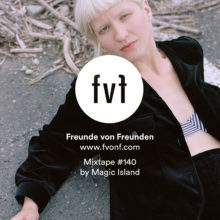 Be sure to check out the mixes from more of FvF’s favorite DJs here.